Eating a bit of cheddar cheese is a simple pleasure that I can't believe I haven't written about before! If I have some in the fridge, it is very likely that I eat some that day. Certainly an everyday pleasure. I grew up with it. In fact, this was always part of a cheese platter at my mom's holiday feasts. My own antipasti frequently features cheddar. My favorite is a sharp cheddar by the local grocery store brand. Not extra sharp. My favorite brand is a bit more sharp and has a better texture than Target's Market Pantry brand and Kraft. I haven't tried Cabot or Cracker Barrel in forever. I usually buy a block on Sunday morning and it usually doesn't last until the next shopping trip. Once I made over a certain amount per hour at work, I can almost always afford it every week now. Before that, I purchased it every once in awhile or when it was on sale. I love coming home from work at 6 and indulging in a glass of red wine and some cheddar on crackers. I particularly enjoy this cheese on the Harvest Wheat variety of Toasteds as the sharpness of the cheese goes well with the buttery cracker. It actually subdues the flavorful Italian Herb Flatbread Crisps from Town House! As for wine, I usually drink Chianti which pairs well, but maybe another red like Cabernet Sauvignon or Montepulciano d'Abruzzo. I may have something else such as charcuterie in addition, like prosciutto or if store brand Genoa salami was on sale, but it is unlikely. As an introvert, I prefer to unwind immediately after work. Some time alone to recharge my energy paired with either a half or full glass of wine (which mellows me a bit) and a bit of food to go with it (to absorb some alcohol) is perfect. I usually stage this little happy hour on my sofa and cocktail table, but in fair weather, possibly at my table and chair on my balcony. If I'm making my pasta specialty, which I tend to do once a week, then I will sip wine and munch on some cheddar while standing in the kitchen, preparing and cooking my dinner. In addition, I love a few slices of cheddar on the side of a sandwich or hamburger like I did this evening. I know that cheddar is not very Italian, but I love this regular simple pleasure of mine! 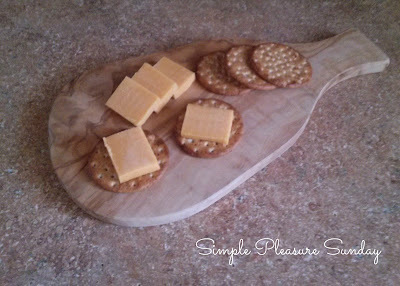 Although, sometimes, I will top a cracker with parmigiano reggiano! I haven't had any type of cheddar in ages but you just made me crave some. lol. I think a young Cabernet would pair really well with it too, as you mentioned. I like Cabernet Sauvignon in the winter, but only have it a bit during other times of the year. I will keep it in mind since I like the idea of good pairings for entertaining. So sophisticated. I'm drinking Montepulciano d'Abruzzo, but didn't buy any cheese this week since I'm trying to get rid of some birthday cake weight gain at the moment! Ah yes! As an Introvert, too, I know so well the need to unwind immediately after work in the sanctuary of my own, quiet home! Here's to simple rituals! After work, a simple ritual like this makes me feel like my bright self again so quickly. It's just plain good too.